Great brand awareness and standing out from the competition are important considerations for most companies. For many, their first port of call in achieving this is through their printed materials. Business cards, letterheads, flyers and brochures – chances are your company already employs some if not all of these marketing tools. However, with so many companies using the same kinds of printed materials, it can be hard to get your collateral to stand out even if the design is exceptional. 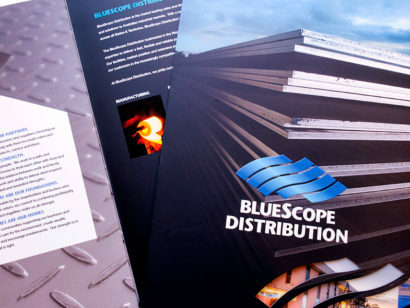 A lot of thought goes into getting the design of your printed materials just right, but how much thought goes into the choice of paper stock or whether to add a spot UV varnish to your design? There are a wide variety of printing finishes available, adding a unique touch to your design that will get your company noticed by consumers. We’ve outlined some of the popular techniques below. Die cutting – This involves the printer cutting a custom shape into your collateral. The beauty of this technique is that your designer can create a custom die unique to your company. Die cutting can be a bit more costly; however, most printers have standard die templates that can be used to reduce costs. Spot UV Varnish – This is a process whereby the printer adds a glossy coating to part of your design. Your designer specifies the areas that are to be covered so, as with die cutting, you get an outcome that’s unique to your company. They can be added to your logo or a branding element to draw attention to that part of the design or can be used to add a pattern or texture to your design without over-cluttering it. Foil stamping – This is a technique whereby the printer applies a metallic material to an area of the print surface. Adding a silver or gold foil to your design, for example, adds an instant touch of elegance and is commonly used on items such as invitations and certificates. There are a variety of foils available, speak to your designer or printer, they will be able to suggest which they feel would work best for your design. Specialty paper stocks – Arguably one of the simplest ways to add interest to your design, the variety of paper stocks available is endless. Use an uncoated stock (think the texture of your office printer paper) with a spot UV varnish or foil to make them really stand out. If you have an eco-friendly message, why not consider printing on recycled, brown or even plantable seed paper? These are just small portion of the finishing techniques available. Your designer or printer will be able to talk you through and suggest finishes that will take your print materials up a level to ensure your company stands out and is memorable.